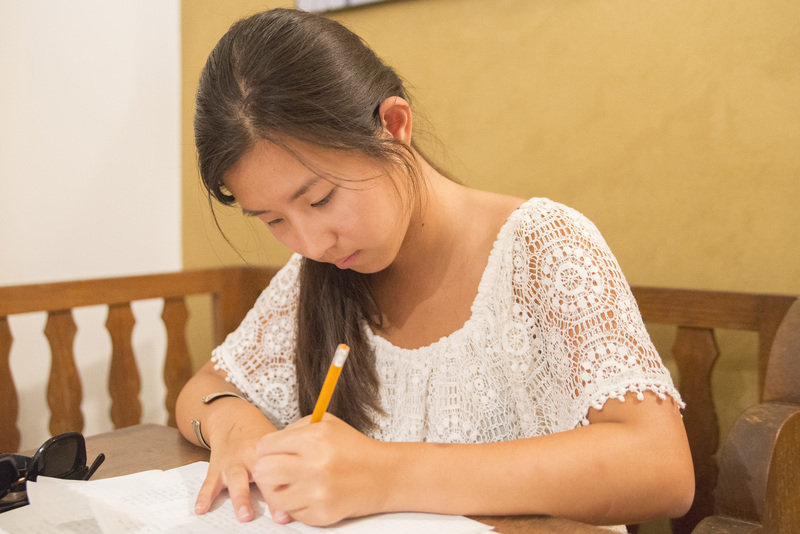 A shot of me by the club’s photographer during my month as secretary of Juliet! Even if you just have an hour, visit Club di Giulietta and witness the legacy that is of Juliet’s Club. Here, thousands of letters addressed to Juliet from all over the world arestored, and of course, replied to by volunteers. Although not as romantic as the movie Letters to Juliet portrayed, it is still a wonderful experience to help someone in need. 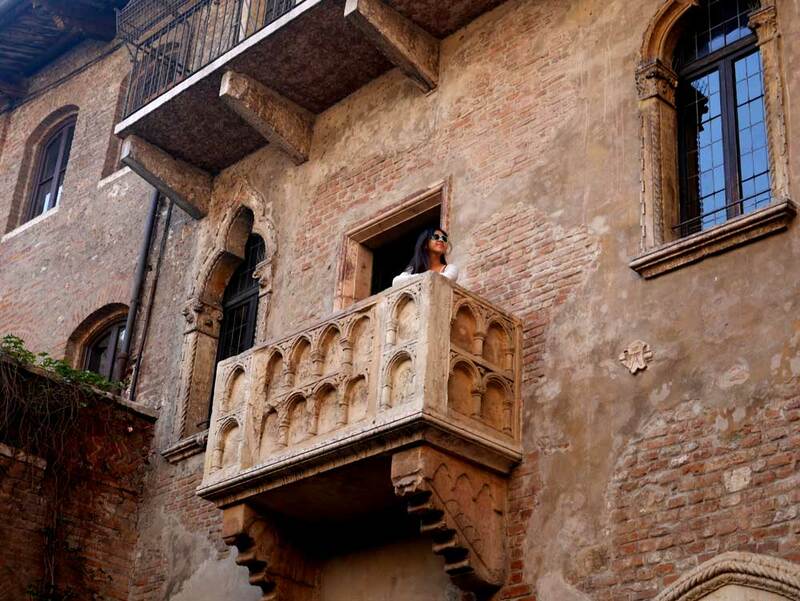 If you are interested: here’s a sneak peek at the secret life of a secretary of Juliet. It’s still pretty romantic though! One of the most romantic sunset I have ever seen, the skyline of Verona from Castile San Pietra is a view that I don’t think I can ever get tired of. 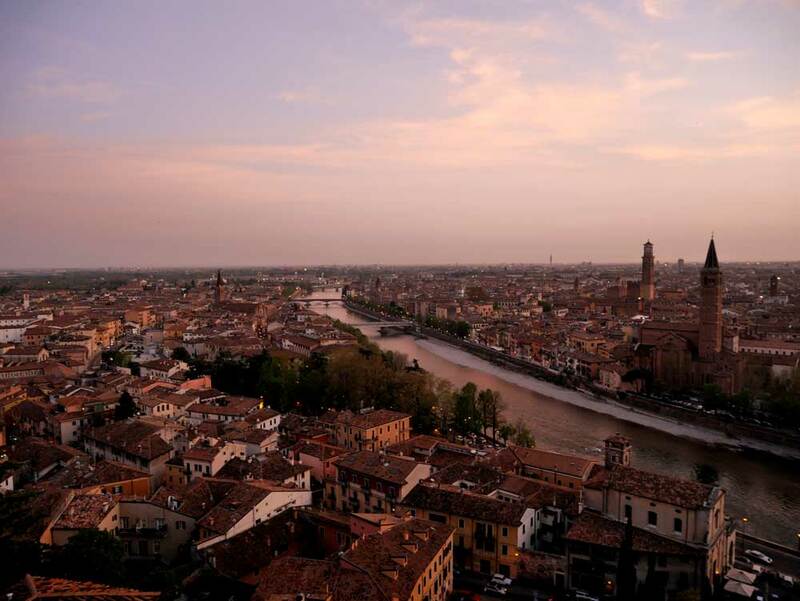 Verona’s buildings are all in a romantic, dusty red and pink colour. Even though the castle itself is not open for public, you can perch on the brick fence along the terrace and enjoy the view. Every late August to September is the Verona Opera Festival, which goes back almost half a century ago. 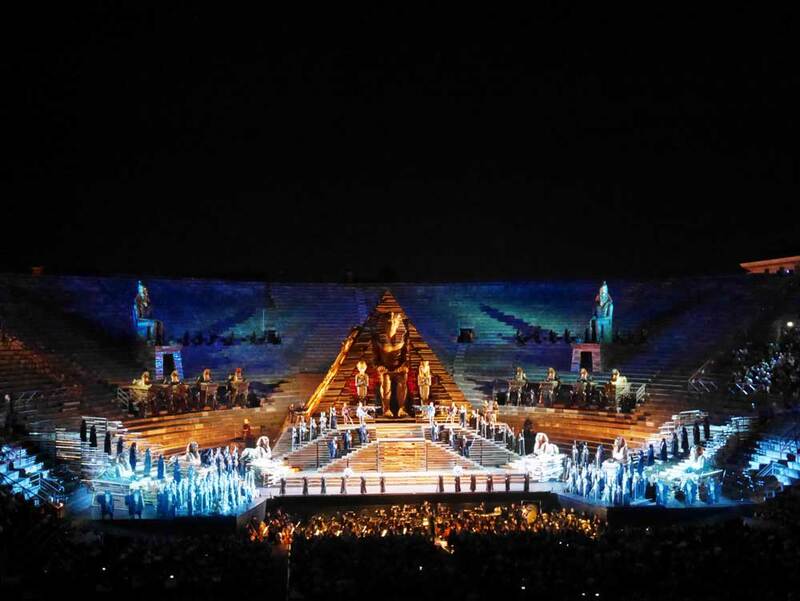 With many spectacular productions such as the iconic Aida, the sets are simply stunning and amplified by the backdrop of the arena stone steps. Ticket prices starts as low as 25 euros on the stone steps, you can enjoy a world class opera plus visit the interior of a thousands of years old monument. If this isn’t a score, I don’t know what is. 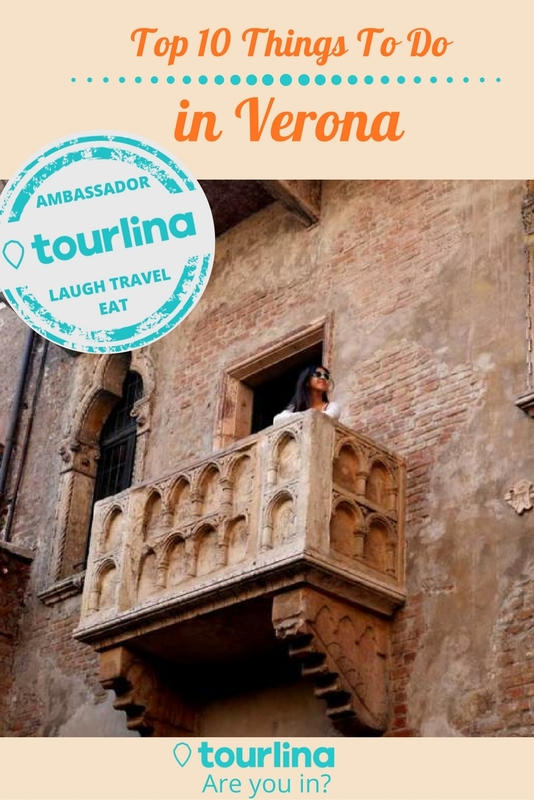 Here’s some tips and expectation for visiting the Verona Opera. 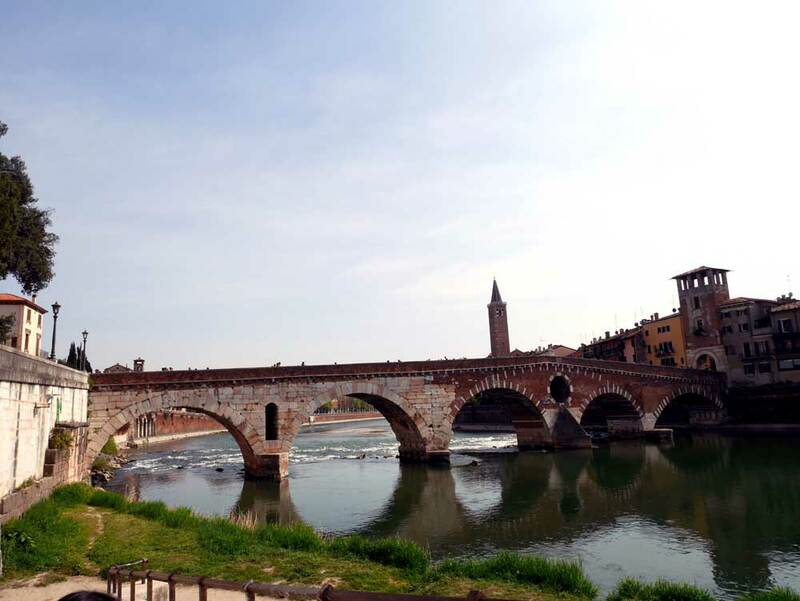 A bridge that rivals the Verona Arena in terms of history, Ponte Pietro literally translates to “stone bridge” and has been around since the Roman times. It is a scenic bridge in itself, and despite being blown up during WWII, it was reconstructed back in all its glory. This is the best place to admire the River Adige, and connects the best focaccia place to Castiel San Pietro. It is not exactly a secret that dining in Europe isn’t the cheapest affair, but apparently it can be. During my month long stay in Verona, I stumbled across this cutest foaccaia that sell slices for 1 euro and pizza for 1.5 euros. And they are beyond words. It might be a lot of carbs, but you can’t beat the price and the excellent taste. For more budget eats in Verona, my budget foodie guide to Verona post is for you. I never thought churches can look romantic, but Saint Zeno’s Romanesque architecture has definitely opened my eyes up to that possibility. 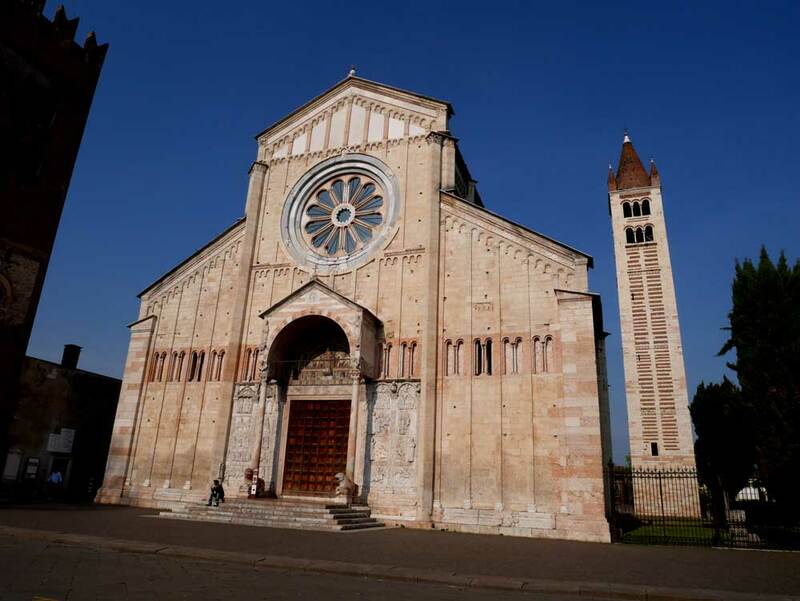 A church consisted of pink stones and a rose window at the front, which represents the Wheels of Fortune. Inside, the church is split into two levels with a set of stairs leading down to the crypt, where Romeo and Juliet allegedly got married. So even though the church might be a little distance out of town, it is worth a visit. 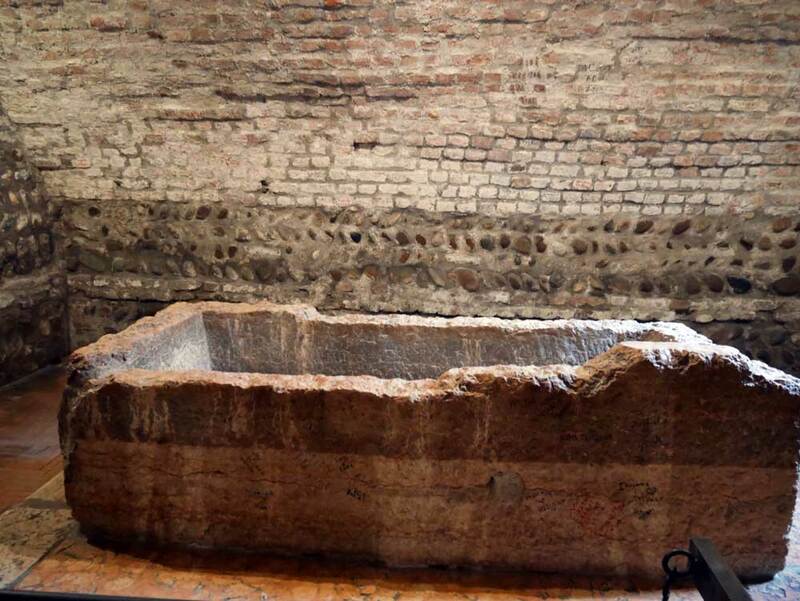 The tomb of Juliet has a longer history than Juliet House. The original site where letters to Juliet was sent, it was also a pilgrimage place where many historical figures have visited. In fact, early visitors used to chip off pieces of the pink rock for Juliet’s tomb, so much so that now it is forbidden from being touched to preserve it. Despite my recommendation, the visit can be fairly anti climatic and you do have to pay to go inside the fresco museum, situated outside the city wall, in order to visit. 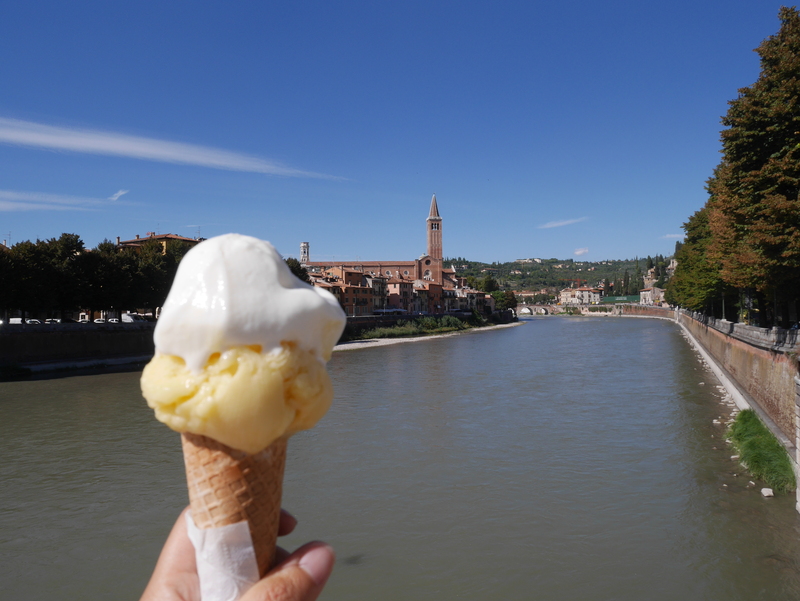 Grabbing an ice-cream and strolling around Verona, what could be better? Italy is famous for its food, and gelato is among the cream of the crops. There are two gelateria in Verona that has captured my heart, one more so than the other with its white chocolate and pistachio flavor. 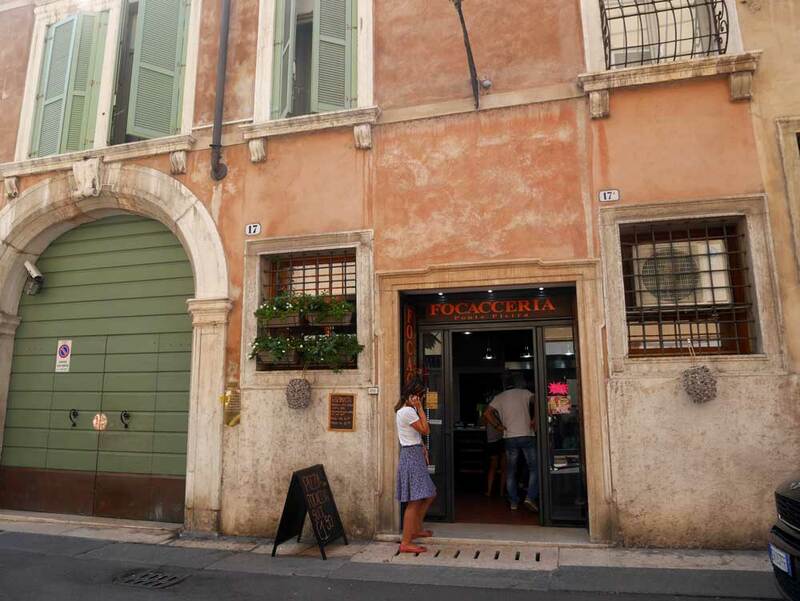 Without further ado, the name of the Gelateria is Ballini, and this is the address: Via Santa Maria Rocca Maggiore, 4. Another bridge on the list, Ponte Vecchio looks like it comes straight out of a medieval fantasy book. 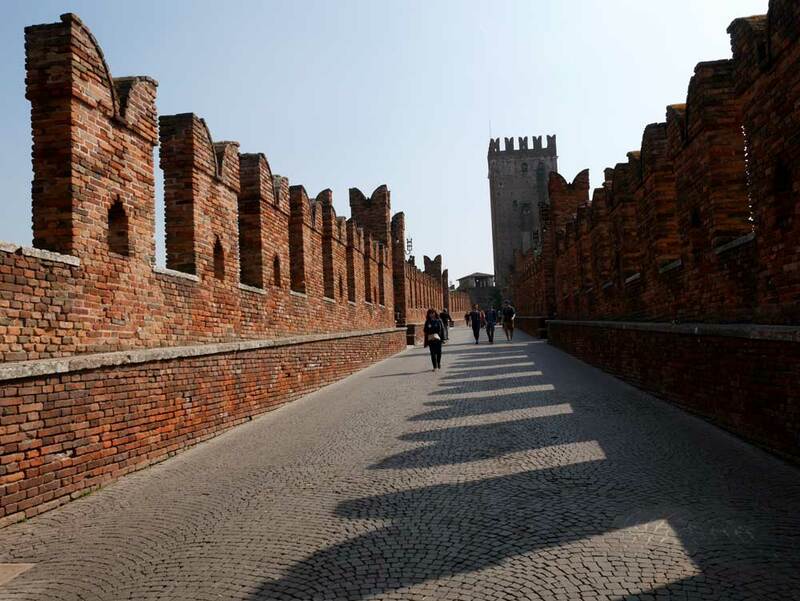 It was built by the Scaliger family, the ruling elite back in the days, in the 14th century. It is on the other side of the meander bend from Ponte Pietro, and links to the Castiel Vecchio. While the castle costs money to visit, the bridge is free and it makes for some good photo. The latest Romeo and Juliet movie starring Douglas Booth had a scene that was shot here. Nam Cheah is a third culture millennial who spent half her life in Hong Kong and the other half in UK. 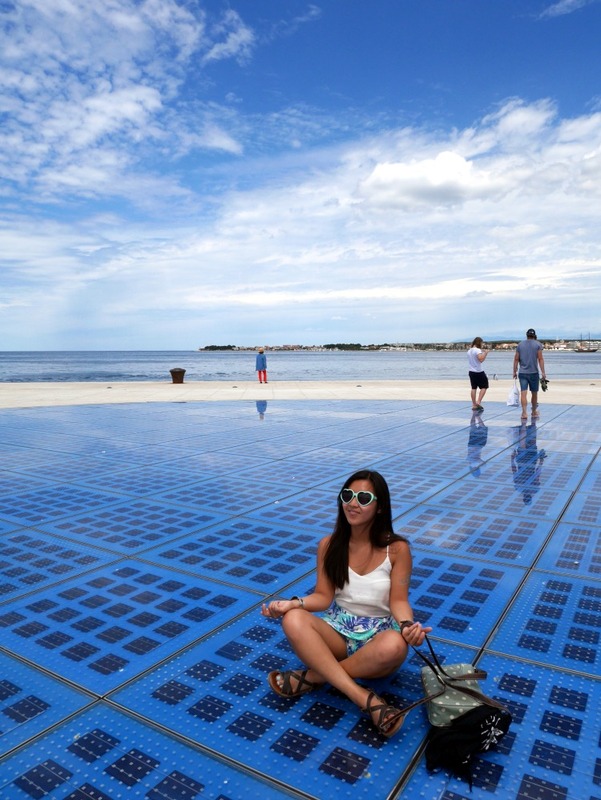 Planning to make the most out of life, she documents her passion to laugh, travel and eat on her suitably named blog: Laugh, Travel, Eat. When she’s not doing any of that, she’s either catching up on TV while online shopping or writing her novels. Tourlina is for women only. With the Tourlina app women can find interesting and entertaining female travel companions within a secure and trusted network.